We tasted this bottle with friends and Eric and Cathy who sourced it at the winery during a family getaway to the Monticello Wine Trail in Virginia's Blue Ridge Mountains. Ironically, I just blogged about Meritage this weekend - a blend of Bordeaux varietals sourced from a new world location, and find it interesting to see one from Virginia. Going all the way back to Thomas Jefferson, who was a huge fan of Bordeaux, he tried to develop Bordeaux varietals in Virginia, even to the extend of bringing vine cuttings from France to his Monticello estate. We visited the Virginia wine country a couple years ago when I kept a second residence in Washington DC during the week to support my work there. We visited the western reaches beyond Fairfax, but didn't get down to the Central Virginia region. Even then, we found Cabernet Franc to be the highest achieving Bordeaux varietal in our tastings, which is the core of this selection. 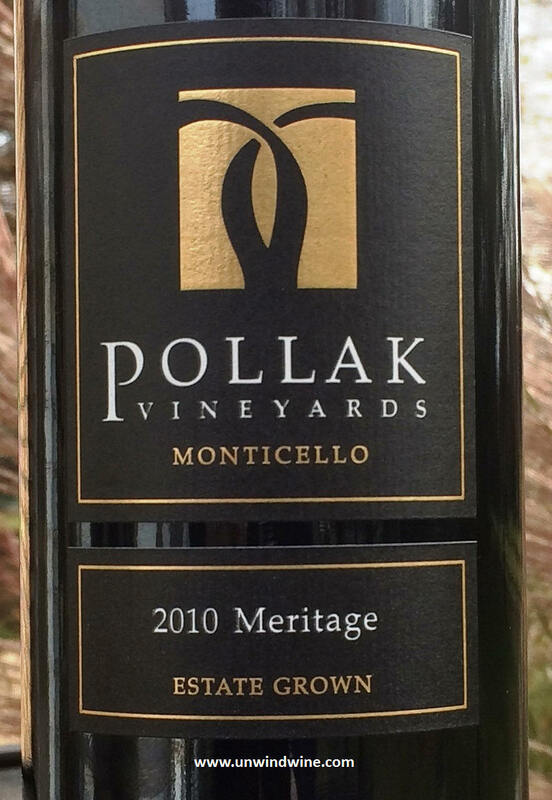 Pollak Vineyards is a family-owned winery in central Virginia west of Charlottesville and Crozet in the foothills of the Blue Ridge Mountains. Their 98-acre farm has 27 acres planted in French vinifera from which they strive to produce estate grown wines that represent the authentic characteristics of the traditional French varietals. The property was acquired in 2003 by current owners Margo and David Pollak. Previously, David was involved in vineyards in the Russian River Valley in Sonoma County, California, followed by the establishment of one of the first wineries in the now famous Carneros region down at the southern tip of Napa Valley where it meets Sonoma Valley. In Virginia, the Pollaks hope to produce great wines using best practices and lessons learned to realize the potential of what they believe is an ideal site. The 2010 Meritage is a blend of 41% Cabernet Franc, 41% Merlot, and 18% Petit Verdot in the Bordeaux style. It dark purple colored, medium bodied with moderate acidity, it shows cherry and currant fruits accented by tones of leather, subtle spice, earth and tobacco, with modest tannins. The fruits are slightly austere perhaps revealing the character of the Virginia soil and terroir. Time will tell how this wine settles and perhaps achieves more balance and approachability with a little bit of aging.